High pH Encapsulating Pre-Spray w/Orange Terpenes. + Perfect for Restaurants, Apartments, Tile & Grout, etc. From Ken of Owings mills , Maryland on 10/30/2016 . 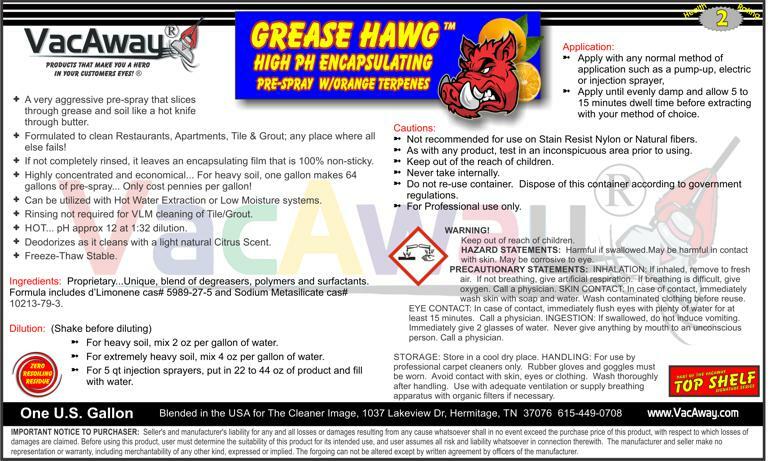 I find Grease hawg to be great for removing grease and oil from olefin as well as residential polyester carpet .when you mix grease hawg and peroxcellent together you have a great formula for encapsulation cleaning that will make your customers very please . From Derick Rudolph of York Springs, Pennsylvania on 5/27/2016 . This Hawg Loves to eat dirt. By far the most rounded encapsulation product used to date! We have used GH in many different environments from commercial to residential for both carpet and tile. Thanks Steve for another Great Product!!! From Juan Rodriguez of Penrose, Colorado on 5/4/2016 . Use this product on a rat nasty olefin carpet and the cleaning results were outstanding. From Alan Trask of Saugus, California on 12/24/2015 . We have been using this product over this year and we have found it to be good with those stuborn stains we get in commercial property it saves time on spotting. From Rickey Reel of Vidor, Texas on 9/25/2015 . Grease Hawg works great and is very economical to use with the recommended ratio of 2-4 ounces per gallon of water. Definitely will order again.